1. Old lead paint. 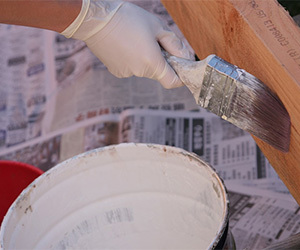 If you have a home built before 1978 make sure to test for lead paint before doing any type of paint scraping or sanding. The lead paint can flake and turn into dust and be ingested by animals grooming themselves. Lead poisoning can cause incoordination, muscle tremors, seizures and death. It is also very toxic for you and your children. You can purchase a lead-testing kit at most home-repair stores before starting renovations. If you find you have lead paint, your best bet is to hire a certified lead-abatement contractor. If you are an avowed “do-it-your-selfer,” the EPA does offer these guidelines but again, professional and experienced help would be best. 2. Current paint, varnish and stain products. Most paints, stains and varnishes used indoors today are water based and will only cause vomiting and diarrhea if ingested. If your pet gets water-based paint on his fur, you can remove it with dish soap and water. If you are using an oil-based product, it is best to let it dry and use clippers or scissors to remove it from the fur. You will need to prevent the pet from attempting to lick the paint until it dries enough to be removed. Never use paint thinner, mineral spirits or turpentine to remove paint from an animal. These compounds can cause pain and chemical burns. 3. Spackle. Dogs are attracted to spackling and will eat it when it is wet or after it is dry. It can cause vomiting, but the biggest risk is gastrointestinal obstruction. Large pieces may not be able to pass through the digestive tract and may require surgical removal. Some spacklings contain ethylene glycol (the same ingredient in antifreeze), but fortunately the amount is very low and unless you have a very small pet or the animal eats an entire container, no problems are expected from the ethylene glycol. If your pet is vomiting repeatedly or exhibiting “wobbly” or drunken-like behavior, see your veterinarian immediately. 4. Tile adhesives, spray foam insulation and polyurethane glues that contain isocyanates as an ingredient can expand in the stomach. This substance can form large foreign bodies that need to be removed surgically. Animals who have ingested these products should see their veterinarian right away. 5. “Pink” Insulation. It isn’t poisonous, but pink insulation can cause mouth irritation and gastrointestinal obstruction if ingested because of the fiberglass fibers it contains. If your pet rubs against the insulation make sure to bathe him well to remove all the fibers. Remember to wear gloves while doing this so that you do not get insulation on your own skin as well. The fibers can be very irritating. 6. Project by-products. Curious pets often want to investigate what you’ve been working on. Leftover dry substances, such as sawdust or drywall pieces, can seem like appealing items to pets to eat or chew on but if ingested in large quantities they can cause problems with an animal’s electrolyte balance. This situation may require intravenous fluid therapy to correct. 7. Power tools. Granted, tools are not toxic, but while we are on the subject of home-repair dangers, it’s worth a reminder to keep your pet contained when using saws, drills, etc. The noises these tools make can sometimes encourage pets to investigate and get too close to dangerous moving parts, either biting the tool itself or the electrical cord. The bottom line is, for safety’s sake, always keep your pets away from home-repair products. Pets are naturally curious and can easily get themselves into trouble. If, despite your precautions, you think your pet has contacted or ingested any of these substances, please call your veterinarian immediately and/or the ASPCA Animal Poison Control Center at 1-888-426-4435.